Well it has taken a long time, but I've been busy doing my MBA, but I finally painted one of GW's newest plaguebearers. I did it to try and get my mind off my troubles, with limited success. I used a combination of colors I hope to use on my forgeworld dreadnought, basically it is camo green and rotting flesh. 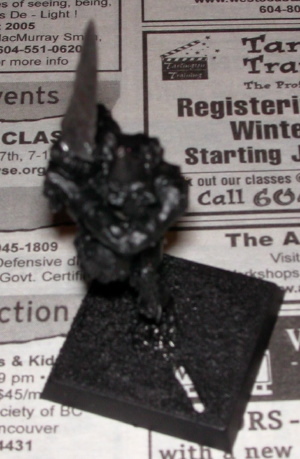 First after cleaning the model I primed it black. I used GW's spray primer. I should have touched up the priming job a bit by hand, but I always seem to let a little metal escape, which I don't notice until I start painting the model. I also drybrushed the weapon using Boltgun Metal and Tin Bitz in classic Gorkamorka style. This was done while I was painting some additions for my Predator. I painted the skin camo green. I then tried to touch up with black the spots that were bare metal. I then did a second coat of camo green. 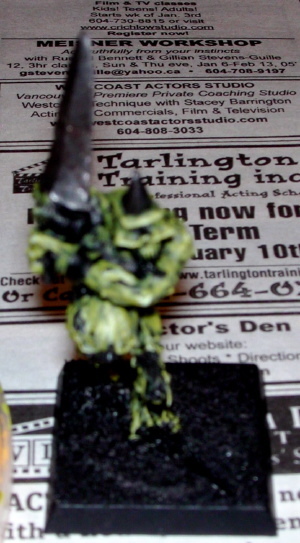 I then mixed in some rotting flesh with the camo green. 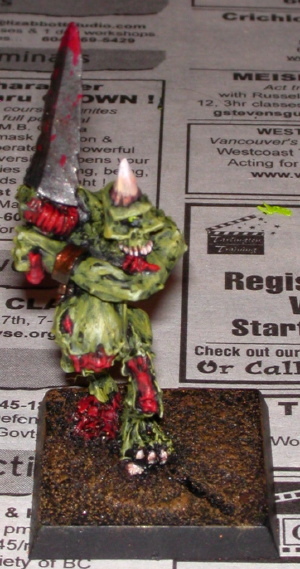 Finally I highlighted with pure rotting flesh. I then moved on to painting the guts. 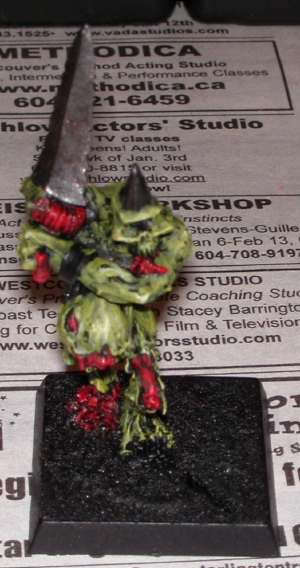 I painted the guts Blood Red, two coats, followed by a red wash. 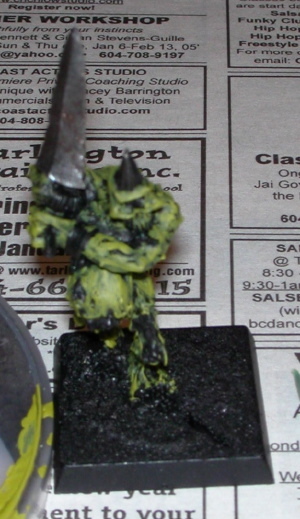 I then highlighted with red gore. Next I painted the bracelet tin bitz. I then used armor wash. I then highlighted the bracelet with Brazen Brass followed by a wash of thinned down Rust Brown Ink. I painted the horns and talons with Beige #917 by vallejo. It gave me a little grief it comes out too thin, you have to really shake the bottle and squeeze out more than you need to paint one little horn. I then used thinned down Rust Brown ink as a wash, another coat of Beige then some white highlights. To finish up I gobbed some Crimson Gore on the sword. I put Black Ink into the eye socket after first painting the eyeball white. I then painted the eye Bilous Green. I did the pupil with black and grey. I finally touched up the skin with camo green and dry brushed the base with a series of browns.